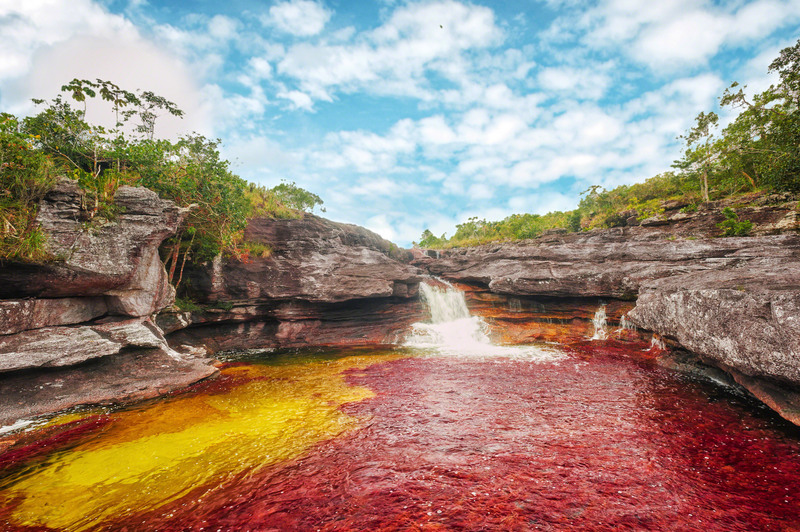 A ‘must-see’ for travelers in search of the most beautiful natural phenomena the world has to offer is the magnificent “River of Five Colors” which is the Caño Cristales in the Serrania de la Macarena province of Meta, Colombia. Often described as a “liquid rainbow”, this single waterway is often regarded as the most beautiful river in the world due to the many colors that appear all at once for a brief period of the year. The vivid colors of the Caño Cristales are produced mostly by the flourishing of brightly-hued water plants, particularly the scarlet Macarenia clavigera blooms that line the river bed. The entire Macarenia is actually one of the geologically oldest regions of the Earth, having rocks that are more ancient than the Andes, themselves. Scientists have regarded the area as “the seed of biodiversity”, having spread life forms to other areas in the continent. Indeed, the Macarenia features three distinct ecosystems rich in diversity of flora and fauna: the Andes, the Eastern Llanos, and the Amazon rainforest. While the region, specifically its multicolored river, has long been a favored site of scientists and photographers, it has only recently been made accessible to tourists in search of the natural beauty of the planet. Visitors enjoy nature hikes and breathtaking views of the unique scenery. The river, itself, has no fish; but is home to brilliantly colored aquatic vegetation. The nearby mountain is home to many interesting animals, with about 420 species of birds, 10 species of amphibians, 43 species of reptiles, and 8 primates. Visitors wishing to visit the Caño Cristales should start their journey in Colombia’s capital city, Bogota, and take an airline flight to La Macarena, Meta . One can also get to La Macarena on a daily cargo flight or even engage a private plane from Villavicencio, which is 31 miles southeast of Bogota. Upon arriving at La Macarena, the traveler should check in at one of the town’s hotels, and make the trip to Caño Cristales the following morning. This involves a 10-minute boat ride followed by a scenic 4-hour walk to the river. It is quite a way; but surely worth the trip. Other places of interest in Colombia are its capital and largest city, Bogota, which is regarded as "the Athens of South America"; and the Las Lajas Sanctuary, a basilica church and pilgrimage site in Ipiales, Southern Colombia, built inside the canyon of the Guáitara River .